I’ll be taking a few days’ break from here while I attend my yearly poetry workshop at Esalen Institute in Big Sur California. In about an hour, I will be leaving for the six-hour drive from our home in southern California to go to central California. I love this workshop as it’s a time for reflection, relaxation, and some heavy-duty poetry writing. We have a craft talk every morning and then go off to write until we get together again to share our work mid afternoons. I’ll take good notes on the craft talks and share them with you when I get back. 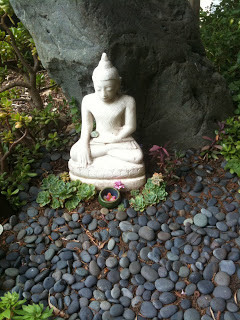 In the meantime, here are a couple of my favorite photos from the Esalen grounds. And reflections from one of my favorite times at Esalen when my husband and I went there to celebrate my sixtieth birthday. As 60th birthdays go it wasn’t too bad. But how would I know any difference? This was the first and last time I’ll ever turn 60. Bob kept toasting me with a “here’s to another 60 years.” Ha! Now, that’s a laugh. I know I feel pretty good, but another 60 is stretching it a bit, don’t you think? I decided to spend my birthday at the place I love the most – Esalen Institute on the Big Sur coast. I turned down a party. I just couldn’t get behind the idea of a celebration this year. My sister insisted, Bob insisted, Sherry insisted, Carole insisted, but I resisted and prevailed. No way. I didn’t want any part of it. A 60th birthday may be a time to celebrate, but with my son, Paul, dead less than a year, I just couldn’t do it. Believe me, Paul wouldn’t have cared, but, I did. I just didnâ€™t feel right having a party this year. Anyway, why should I worry about what they all wanted. Iâ€™m the one who turned 60. I knew I made the right decision as we drove North on Friday. As soon as we got past Santa Barbara I started to relax, sink deep into my seat, take some long deep breaths and watch the beauty of the world go by. The verdant hills looked like they had been painted with sweeping brush strokes of mustard yellow, the rows of newly planted grape vines stood tall and proud as little toy soldiers, and the clear sky except for a few Georgia O’Keefe clouds beckoned us up the Coast. It looked like just plain heaven to me. And I figured that if it were this good on the road, what would come next would be even better. It wasn’t easy getting Bob to agree to go. Esalen, created in the 1960s where people gather to expand their minds, relax their souls and work on their bodies; eat fresh, healthy food, and soak in the hot springs baths while watching the waves of the Pacific, is my place. I’ve gone there many times without him, and he is very happy to have it that way. But, this time he really had no choice. Of course, I offered bribes. He got to choose the workshop, he got to ogle all the naked women in the hot baths and he got to spend as much time with marvelous me as he wanted all weekend long. There would be no interruptions – no telephone, no email, no exercise classes, no work. What the hey? He took the bribes, and in his inimitable way, he came along and participated fully and willingly. The truth is, thereâ€™s not a lot at Esalen to complain about. Sure, the digs are a little primitive, sure, there is no room service, sure, all calls have to be made on a pay phone, sure, meals are served buffet style and before shoving our dirty dishes into the kitchen area we have to scrape any leftovers into the compost pot. Thatâ€™s about it. There is so much more to like. The breathing sounds of the ocean as it laps against the rocks below are hypnotic, the pungent smells of fresh herbs and pine tickle the senses, the fertile ground that produces grapefruit size roses along side rows of emerald green vegetables boggles the mind, and, the hot baths soothe not only the body, they heal the soul. Itâ€™s like no where else Iâ€™ve ever been. Itâ€™s where I can go to be completely relaxed and at peace. I made the perfect decision. I wouldnâ€™t have wanted to turn 60 any place else. Beautiful, Madeline. I feel like you have transported there by your story. Enjoy every moment.I hope it is all you want and need it to be. Beautiful, Madeline. I feel as if I have been transported to Esalen through your story.